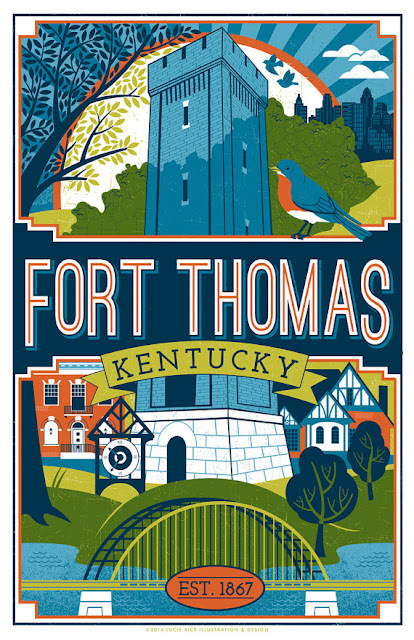 The last cover for the October edition of the Fort Thomas Living included a black and white version of Lucie Rice's, "Fort Thomas" print. I'm sure you've seen them around town. We asked our readers, if they were so inclined, to color that cover. Or design it in some unique way. There are extra copies right now at Fort Thomas Coffee and the Valentines will hang your mini-masterpieces on their walls of the shop when you're done decorating. So what if yours is picked as the "best in show?" We'll put the winners on the next cover of the Fort Thomas Living. Give it a shot! I thought I’d try a little something different with this cover. You may recognize this cover based on the colorful poster design currently for sale at Bowman's Framing in Fort Thomas. It’s by Fort Thomas native, Lucie Rice. She revamped it a bit so that you (or your kids) can design, color or add to it. So do that. Then take your version of Lucie’s artwork to Fort Thomas Coffee for display. We will work together to pick the best and do something nice for the winner. She’s working as a freelance illustrator and graphic designer in Nashville, TN and some of her other designs may be purchased at Fort Thomas Central or directly from her Etsy shop (LucieRicePrints). See Lucie's full portfolio at lucierice.com. I’m sure I’ll see you around the Fort!